UN-brokered ceasefire between government and Shiite Houthi rebels takes effect. All sides in Yemen's year-long war have pledged to honor a UN-brokered ceasefire which took effect at midnight Sunday, AFP reported. Fighting over the past year has killed thousands, displaced 2.4 million, and drawn in Yemen's neighbors. The chief of staff of forces loyal to President Abedrabbo Mansour Hadi confirmed "the ceasefire has taken effect" at 2100 GMT. General Mohamed Ali al-Makdashi told reporters that "we are going to respect it... unless the Houthi rebels violate it". Three earlier attempts at ceasefires collapsed after a Saudi-led coalition in March last year began air strikes to support Hadi’s government. The coalition intervened after the Shiite Houthis overran the capital Sanaa in September 2014 and later advanced to other regions. 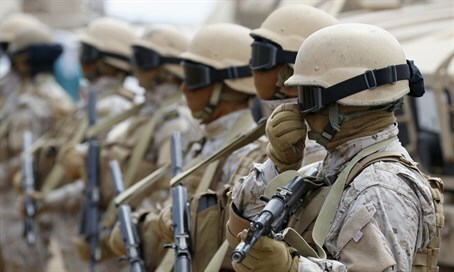 The Houthis, along with allied troops loyal to ex-president Ali Abdullah Saleh, have sent the United Nations a letter committing to "cease land, sea and air military operations" throughout Yemen, according to a communique carried by the rebel-run Saba news agency. In a contrast to earlier ceasefire attempts, some Houthi leaders met with loyalist troops on a joint committee to make sure both sides comply with the truce, coalition spokesman Brigadier General Ahmed al-Assiri told AFP. "And they will monitor all the personnel on the ground, to not violate the ceasefire," he said, adding the committee is supervised by the coalition which has also pledged to abide by the ceasefire. Previous UN-sponsored negotiations between the Houthis and government officials failed to reach a breakthrough, while a ceasefire went into force on December 15 but it was repeatedly violated and the Saudi-led coalition announced an end to the truce on January 2. Meanwhile, the Arab alliance said it reserved the right to respond to any rebel violations.